You might be wondering why bad guys look healthier and have a longer life, than good guys who live sickly and have a short life. Why many bad and notorious people look rich in every angle? It's not only you who think that way. Is it just imagination, jealousy or envy? I was one of them searching for the reason when I was still young several decades ago. Is there any way to be rich in wealth, health and live longer? Yes, you can as you wish. Here's how. First, think bad, do bad, and live bad, then you might be chosen to be healthy and may live longer than average. Perhaps you have heard the saying, "Ill weeds grow apace. The fairest flowers soonest fade." Why is it like that? According to our 40 years of research and observation, we understand that our health condition seems to depend on the activation rate of the brain. We believe that those who do and think bad things use and activate their brains more compare to those good people. 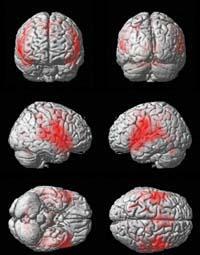 As shown from the above photo, the activated brain portion of bad people (in red color) is greater than the brain of good people. Honest teachers, good scientists, kind doctors, and other wonderful people think less so the activation of their brains seems to be fewer than that of bad people. Does it mean that most popular teachers, scientists, and doctors are not activating and using their brain as much as bad people do? Yes, we believe so. We believe that most good people are lonely or depressed, resting their brains in the fields. Whenever the brain is greatly active, the negative energy (origin of viral diseases) has difficulties in attracting or attacking the victim. However, once you are attracted by the negative energy and started suffering from diseases, you might have difficulties in eradicating the negative energy from your body by activating your brain alone. Of course, we do not deny that food intake and environmental factors also affect our health and life span. However, from our 40 years of records, we were able to gather some results and informations that if you want to be healthy and live longer, use and activate your brain as much as we can. We believe that we can extend our life in good condition. I myself am also a model from the above statement. It is true that we may need more study about this, and my idea of this article has been helping our people for improving their lives. It's not too late, why don't you try to use and activate your brain more often from now on. Finally, how do you get rich in wealth? This is really what you want to know. I have met uncountable number of rich and prominent people for me to know how to get rich just like them. They told me about being stingy for unnecessary home expenses. Unnecessary home expenses are the luxurious items. Do not buy anything by credit. They told me that you can buy them when you have plenty of wealth. In fact from these 40 years of time, I never bought anything by credit. Do not envy those who are rich with ill-gotten wealth. For sure they will fall to the bottom of hell while they are living. Just think and follow good deeds and your brain might be working and activating well. And, yes, I am trying to be rich in every angle, too :).